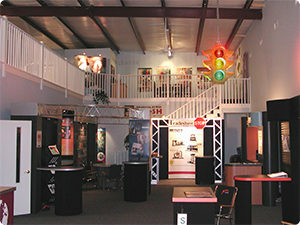 Tradeshow STOP, Inc. is a family-owned and operated company, with a reputation for superior performance and extensive experience within the trade show exhibit and services industry. We have earned our reputation in the community by building successful, long- term relationships with our clients, on a foundation of exemplary service and value-added products. Nashville-based, we represent a convenient resource to Middle Tennessee companies and provide unique offerings to clients near and far. For example, most companies in the trade show distribution business are tied in, exclusively, with one major manufacturer. Tradeshow STOP, on the other hand, represents seven of this Country’s premier vendors, as well the European leader in this sector – which includes Abex, Classic Exhibits, ExpoDisplays, Expand International, Laarhoven, Nimlok, and Orbus. As a result, not only do we have one of the largest selections of portable and modular displays available in the Mid-South, we are not compelled to sell a particular line of equipment. Rather, we perform a thorough needs assessment for our prospective clients, then match their needs to the best option(s) available, representing the best value for their trade show dollar. 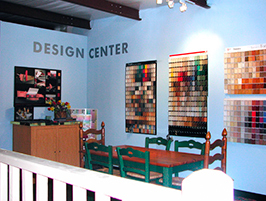 Similarly, most companies in our business specialize in either portable/modular equipment or custom-built displays. Through our exclusive alliance with one of the best custom houses in the country, we can offer both with expertise. We rent trade show display equipment, sell used displays and even help clients sell their old equipment. We also offer one of the most comprehensive selections of trade show accessories and ancillary services available in the Mid-South, with strong and proven relationships with scores of highly valued suppliers. 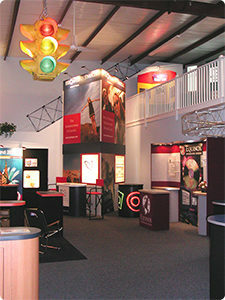 Tradeshow STOP provides a full range of graphics design and production services. In addition to “traditional” large format trade show graphics, we can create banners, banner stands, brochures, catalogues, magazine and newspaper ad designs, point of purchase graphics and packaging. All of our “traditional” trade show graphics are produced using the state-of-the-art Lambda Photo Process. Lambda provides true photographic quality, continuous tone and rich colors. More importantly, with Lambda, there is no delamination (an inherent problem with ink jet). The laminating process used to protect the printed surface is guaranteed: no peeling, no delamination, no tunneling, no discoloration for the life of the graphic under conditions of normal handling, usage and storage. Because of our special partnership with the only Lambda printer in Tennessee and our volume of graphics business, we can provide Lambda quality at, or better than, ink jet prices with turnaround, typically, in 72 hours. We offer assistance in trade show marketing, including tips on how to manage the booth during a show, promotional items (e.g. T-shirts, giveaways), lead generation and follow up. Finally, Tradeshow STOP offers a comprehensive Show Services and Management Program, with over 5000 shows to our credit without a single instance of a missed deadline or lost equipment, not a single dissatisfied client. The Program is tailored to each client, dependent on their individual needs. We take the headaches and worry out of the planning/scheduling/shipping/storage/set-up & tear down process and save clients money at the same time – they love us for it! Jay & Carol Larimore and the entire Tradeshow STOP team.